LAKELAND – For students at Africa University, United Methodist dollars have made a world of difference a half-world away, and Bishop Ken Carter would like to see the Florida Conference step up its financial support in the years to come. 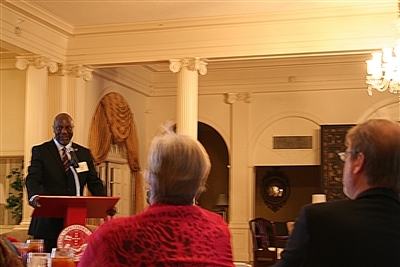 Jim Salley, associate vice chancellor for Institutional Advancement for Africa University in Zimbabwe, brought faraway success stories closer to Florida with a slide presentation Monday for the Cabinet and other conference leaders and staff gathered at Florida Southern College. “We don’t say people pay,” Salley told more than 50 who came to learn about ways to help the institution started in 1992 by The United Methodist Church. 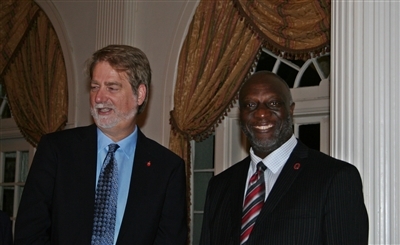 Bishop Ken Carter, left, and Jim Salley of Africa University seek stepped-up support for The United Methodist Church institution in Zimbabwe. Photos by Susan Green. Africa University has sent more than 5,000 graduates into the world, mostly to jobs and leadership roles on their home continent, Salley said. Carter said he believes the institution is one of the top three or four most fruitful ministries the church has ever carried out. “The purpose is really to be part of what God is doing in the world,” the bishop said. Exactly what role the Florida Conference will adopt – supporting scholarships or capital campaigns, for example – will be determined over the next year. Rev. Dr. Sharon Austin, Connectional Ministries director, will spearhead discernment efforts toward that goal, Carter said. He has invited Salley to speak at Annual Conference 2014. Beyond continuing work that benefits others, though, Carter said he hopes that deeper involvement in the ongoing ministry in Africa will help unify a multicultural, multiethnic Florida Conference. “We have the second largest African-American population of any state,” he said, adding that he hopes stepped-up support for Africa University will bring together Florida Methodists from all walks of life. The 2010 U.S. Census revealed that Florida is home to about 3.2 million African Americans, second only to New York with 3.3 million. Those attending Monday’s presentation received prayer cards encouraging them not only to embrace a new connection to Africa University but to pray regularly for the institution. They also received information about the university’s endowment campaign, which includes goals of $25 million toward student scholarships, $18 million toward research and other program initiatives and $7 million toward technology and facility improvements. Strengthening ties to Africa University would bind the Florida Conference even more closely to a continent that struggles daily with widespread disease, violence, hunger and severe poverty. Last year, Florida Methodists celebrated 10 years of a covenant relationship with the East Angola Conference that has centered largely around rebuilding the Methodist-affiliated church, orphanage and school in Quessua, a community ravaged by war. Jim Salley, associate vice chancellor for Institutional Advancement at Africa University, talks about the growth of the United Methodist institution founded in 1992. Among students benefiting from the establishment of Africa University is Chicosseno Salvador, an orphan from Quessua, who received a scholarship to study at the Zimbabwe campus, Salley said. Salley noted that 52 percent of Africa University’s students are female, providing the hope of a better life for women who in many cultures are discouraged from pursuing an education. University students and graduates are carving a significant place in world research, Salley said, listing strides in agricultural food production and recently a collaboration with the London School of Hygiene and Tropical Medicine that led to production of a lightweight, insecticide-treated blanket to kill mosquitoes and reduce deaths from malaria. The institution was founded 20-plus years ago as a result of Methodist church growth in Africa, Salley said. Florida is among 27 annual conferences that gave 100 percent of apportionments assigned by the General Church for Africa University last year, Salley said. That money largely goes toward operational expenses for the institution, which accepts students from across the African continent. Salley also outlined contributions from many in the Florida Conference, including Dr. Wee-Li Tan, president of the Florida United Methodist Foundation and former treasurer of the Africa University board. Before that, in the 1990s, the Florida Conference raised money to build a two-story dormitory at the university. Dr. Joreatha Capers, senior pastor of Ebenezer UMC, Miami, was among speakers who talked about the rewards of supporting Africa University. Her congregation recently donated $1,000 toward a scholarship fund at the school. Multicultural issues posed a challenge in the early days of Christianity, and they linger today, Capers said. The ministry of Africa University can help bridge any divisions created by varied backgrounds. For information about Africa University, visit www.support-africauniversity.org.